Showerman is not a superhero that bathes dirty villains but he might be one day and that’s what lead to this trademark dispute. 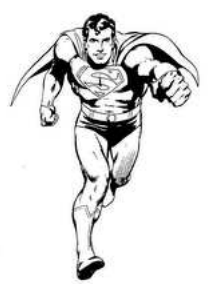 DC Comics has opposed the registration for SHOWERMAN, the logo for a shower door salesman and the illegitimate cousin of Superman. The first story of Superman was published back in 1938 and, arguable, he is the most famous and popular comic book character of all time. DC Comics has been using the trademark ever since. DC Comics owns numerous registered marks for the name, SUPERMAN, the diamond logo, and also some for the look of Superman including the mark that can be seen to the left. 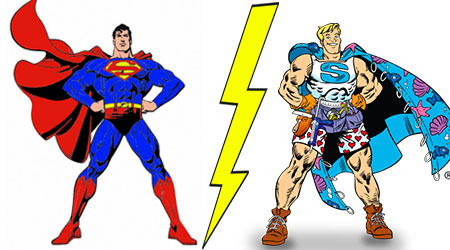 DC Comics opposed the SHOWERMAN mark claiming that the mark is similar to DC Comic’s SUPERMAN marks in sight, sound and commercial impression. Its not hard to see that Superman was clearly the inspiration for Showerman. While this may just be a parody, parody is only a defense to claims of infringement and not a reason to justify a trademark registration. Balaban has the opportunity to fight the opposition, make a deal with DC Comics, or walk away from the application. I don’t think this application has much of a shot so best to settle and fight another day, Showerman.